Ever felt overwhelmed by choices when it comes to cannabis consumption, thus wishing for a highly specific, practically bespoke option at your fingertips? Medmen’s very own effects-based line, [statemade], just might be the solution to your current state of cannabis confusion: [statemade] offers seven different effects to choose from, whether you want to catch some zzz’s, or get blissed out. This week, we’re getting to know: zen. Dreaming of reaching your own personal enlightenment, but can’t ever seem to get there? Do you wish for inner peace amid everyday chaos? Perhaps it’s time to seek out zen. You don’t have to meditate for hours or practice mindfulness in a hot yoga class (unless that’s your thing, of course). Instead, find some semblance of serenity in Medmen’s [statemade] line, which is ideal for every type of cannabis user, from newbie to connoisseur. Each effect comes in four forms—vape, flower, drops, and pre-rolls. If you prefer getting buzzed via pen, expect to get a whopping 360 mg of THC out of zen’s vaping option. On the other hand, zen’s nearly flavorless tincture drops -- launching next year -- will contain 150 mg of THC, and can be added to anything or taken directly. Want to share your zen with like-minded individuals? 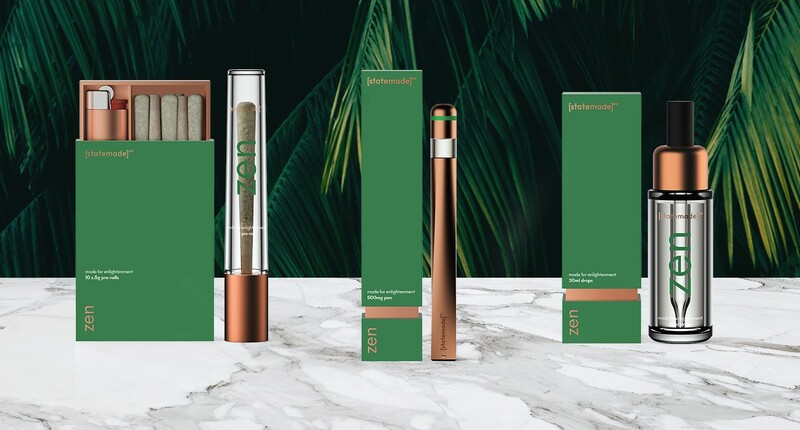 A pack of pre-rolls include 226mg of THC, 0.6mg of CBD, and a very chic lighter. The choice is yours, wise one. Even better: Each [statemade] effect comes in its own stunning, minimalistic packaging, making them a perfect go-to for the holidays. The tricky part will be actually gifting these goods, since they’re so striking, we know you’ll want to admire them on your own shelf. Who knew finding zen could be so easy?